Instead of heading out to stand in long lines to buy stuff why not do something positive for your finances instead? Personal Capital is offering up a sweet little Black Friday incentive deal to try out their services (which are pretty awesome). 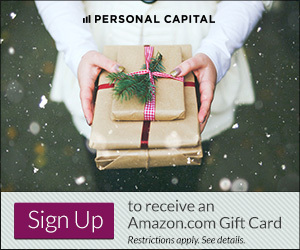 Open up an account with Personal Capital and you could get an Amazon Gift Card! The first 1,000 people that open a Personal Capital and link a financial account get a $20 Amazon gift card. The next 3,000 that sign up and link a financial account get a $10 Amazon gift card. This has to be a new account. This giveaway is open from 12:00 am PT on Friday, November 28, 2014 and expires at 11:59 pm PT on Monday, December 1, 2014. But remember, it’s only the first 1,000 that get the $20 gift card and the next 3,000 who get the $10 gift card. After that you still get a great account to track your finances but you don’t get the gift card bonus. What’s great about Personal Capital is you can connect your financial accounts up with them and see everything in one place. This includes banking and your investments. This is so helpful when you want a bird’s eye view of your money. For one, it’s great to see how much cash you have available. Secondly, and thsi is important, you can see all of your investing accounts in one place. Most of us end up with a number of places we have investments what with 401(k)’s, IRA, and other brokerage/investing accounts. It can get tricky keeping up your allocations across all of your accounts. When you have one place to see them it makes your planning and investing much more efficient. Oh, and their account to track your finances is free. And you can get a smartphone app to follow along on the go. Yeah. They also give you advice on your accounts to help you make sure you’re getting the best with your investments. So even without a bonus it’s a great deal. But an Amazon gift card just sweetens it a bit more. Here’s our Personal Capital review but make sure you come back and use the special link below to sign up for the bonus. *As always make sure you read all the fine print.